I have to squeeze out a quick entry before I collapse into naptime–but since I haven’t really updated on progress since NSR I, I’m really behind and should make an entry at some point before the season is over. There has been a lot of activity since we finished up in singles back in April. We immediately transitioned in to doubles for NSR II and raced in order to send a boat to Bled for the first World Cup. I did not race with Ellen this year because she is dealing with some chronic injury issues and is taking the time she needs to get healthy and be a contender for the World Championships later this year. In the meantime, I am rowing with Jessi Reel (Stanford ’09). Jessi and I are a decent match in the small boat because like me she packs a big power punch for someone her size, but for now our main challenge is dealing with consistency both in practice and from one practice to the next. It’s taking time to build boat chemistry and find reliable speed and rhythm but we have both learned a lot over the past month rowing together. Kate and Stesha won the NSR and so got the 2X spot to race at the first World Cup. They won bronze there which means they are in position to declare the W2X for the 2010 World Championship Team if they want it. They have until July 19 to accept the bid, but in the meantime are back with us in Princeton training and preparing for Lucerne. The sculling group is unfortunately quite small right now due to injuries and other maladies; so preparations for Lucerne are slightly tentative in that we don’t actually know how many healthy athletes we will have, or what they will be capable of over the next few weeks. But my experience tells me that I can only focus on myself, my body, my training and getting as much out of what I have as I can while we go in to shotgun selection mode for the month of June. In other news, the weather has mellowed out a bit, and was a refreshing 69 degrees this morning for our two a.m. rows. After a week of 80+ temps and high humidity, it was an incredible morning on the lake with great visibility and sunshine. The next few days promise to hold similarly good conditions so I am looking forward to that before we are cranking back up in the 80s. Jersey summers could be bearable if they were like this all the time! My garden does love the hot sticky weather though, and things are rocketing up. We have been harvesting snow peas and sugar snap peas for several days, as well as lettuce and fresh herbs. 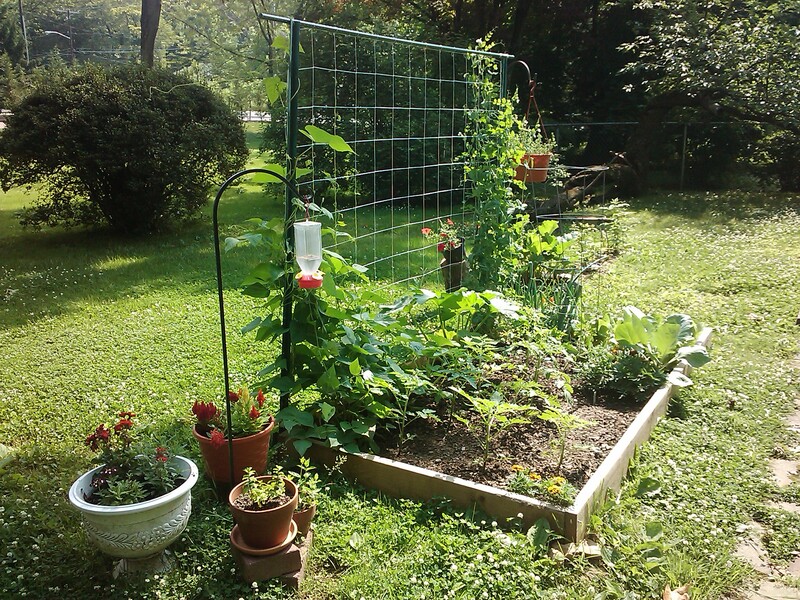 I have my first flowers on my bean plants (which have already overgrown the trellis) as well as flower pods getting ready to open on my zucchini plant (which is trying to take over everything). I am very pleased with how everything is looking, and am looking forward to the good stuff later this summer! I took this photo last week, things have gotten even bigger since then. Also, I am happy and excited to report that I have at least one hummingbird that frequents the feeder I have up in the yard. Nothing like the frenzied hummer community I had at my house in Wisconsin growing up, but I am happy to have her around nonetheless. Thanks for the update – good luck with the training!